Indian Army has invited applications for married/ unmarried Male Engineering Graduates for Grant of Permanent Commission in the Army in all Arms/ Services 125th Technical Graduate Course (TGC-125) will Commence in July 2017 at Indian Military Academy (IMA), Dehradun, Uttarakhand. Age : Candidates age should be 20 to 27 years as on 01-01-2017. (Candidates born between 02 Jul 90 and 01 Jul 97, both dates inclusive). Educational Qualification: Candidates should have passed Engineering Degree (B.E/ B.Tech) or appeared in the final year examination of Engineering course. Selection Process: Candidates will be selected based on cutoff percentage as decided by the HQ of MoD (Army) & Interview, Medical Examination. How to Apply: Eligible married/ unmarried Male Engineering Graduate candidates may apply online through the website www.joinindianarmy.nic.in from 08-11-2016 at 10:00 hrs to 07-12-2016 at 17:00 hrs. 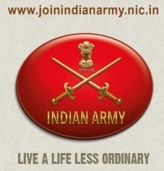 Advertisement Details: Pl check www.joinindianarmy.nic.in .